Mediterranean Pasta with Chicken – Dancin' and Cookin' in the Kitchen! It’s still a bit rough for me around the house… still can’t get my “chopped up” finger wet with those stitches… and I had a crown put in today… and my head is pounding! So, easy pasta dish it is! I’m going to try to do more than just pasta dishes… but to be quite honest… anything that has pasta, chicken, and vegetables… no matter the combinations… you can almost bet I’d love it! This one is a very good one, but you have to like capers. I do though!! Cook the pasta according to the package until al’dente. While the pasta is cooking, place the chicken into a skillet w/the olive oil, salt and pepper the chicken on either side before you place into the skillet (or after!). Cook until browned, and then add fresh herbs and the chicken broth. Bring to a simmer and add the spinach. Stir in the cooked pasta, and then add in the vegetables and let simmer until thickened. Stir in the capers, top with parsley and serve. Enjoy! 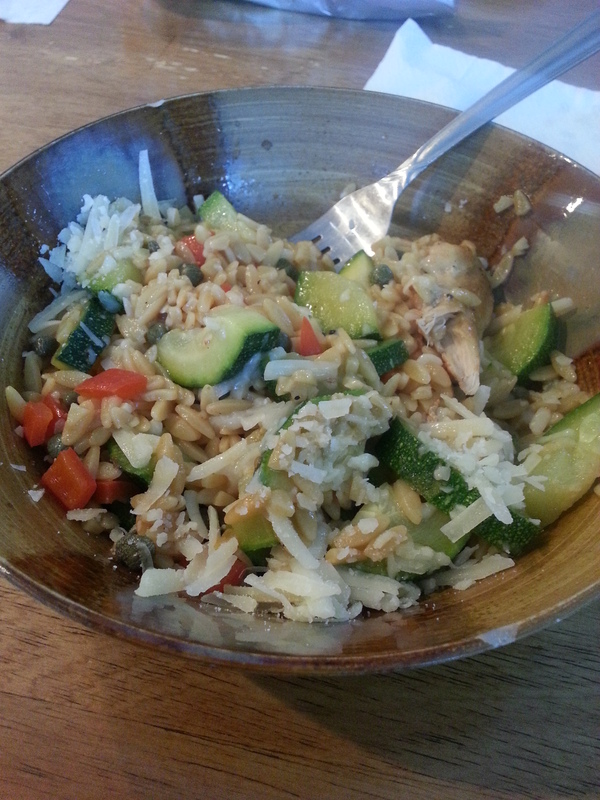 This entry was posted in Main Dish, Mid-day and tagged capers, chicken, orzo, spinach. Bookmark the permalink.